Annual Program-wide Retreat Held each spring, residents and faculty working groups meet in faculty or resident homes to discuss areas for program improvement, with working groups coming together and a Program-wide session to report on recommendations and next steps. Intern Research Retreat Led by Residency Research Director, Dr. Phillip Chan, this annual winter retreat brings together faculty and support staff, IRB members and statisticians to provide an introduction to crafting and implementing a research project, enabling interns to “hit the ground running as early as spring of their intern year. The retreat is followed by an evening social event. Student-to-Intern Retreat Held as part of our new PGY-1 orientation, new interns learn essential skills such as sign-out, high-value care, time management and EMR skills in a relaxing environment while bonding with their peers, followed by an evening social event. Intern-to-Resident Retreat Held each spring, all interns spend a half day together with senior residents and selected faculty in preparation for their roles in what we feel to be the most important of residency transitions. Interns learn skills addressing team leadership, running codes, clinical reasoning and education skills. The session is followed by an evening social event. Morning Report runs every weekday from 8-9 AM. At Rhode Island Hospital, it generally features two case presentations by ward residents with a discussion facilitated by the Chief Residents, while the smaller groups at the Miriam Hospital and VA Medical Center allow for more in-depth discussion of a single case. At all three sites, special attention is paid to the generation of sophisticated differentials, the use of physical examination techniques and relevant clinical images. It is well-attended by the Residency Program Directors, Ward Attendings, and medical students at each site. Many residents find this session to be one of the greatest strengths of Brown's didactic educational program. Noon Conference is held Monday through Friday at Rhode Island Hospital. 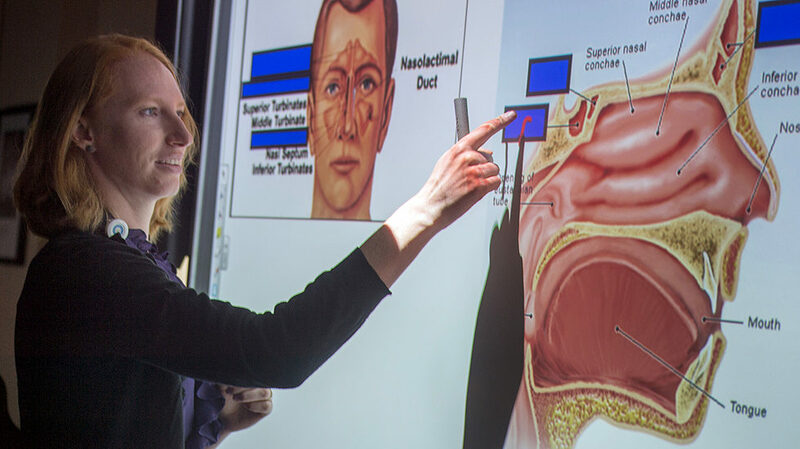 Faculty within various departments gives lectures on internal medicine and medical subspecialties, as well as topics in neurology, dermatology, orthopedics, ophthalmology, and psychiatry. At the end of each month a pathologist reviews various pathology samples obtained from the month’s inpatient cases. Global Health lectures are held in conjunction with the BRIGHT scholar program. Intern conference occurs once weekly from 12-1 at all three hospitals and is led by the Program Directors and Chief Residents. The conference is attended by interns on inpatient rotations and serves as valuable protected time, as senior residents handle all clinical care allowing interns to relax and focus on their own learning. Early on in the year, the curriculum addresses bedside management of common clinical scenarios. 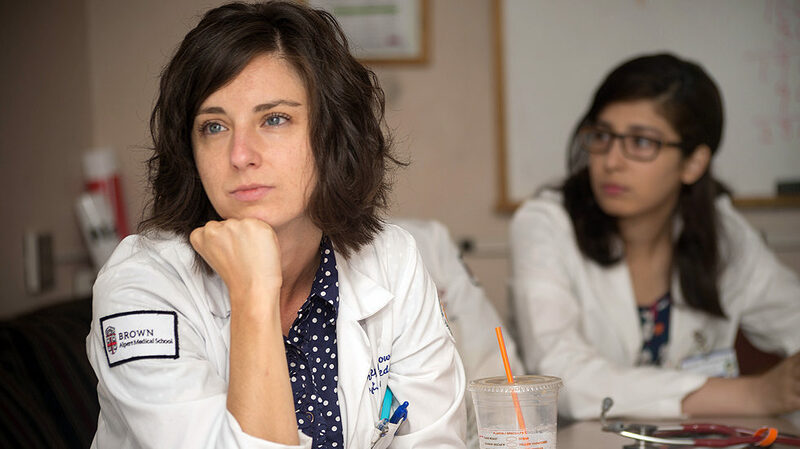 Brown's "How To Be A Resident" series pave the way for a smooth transition to the PGY2 year. 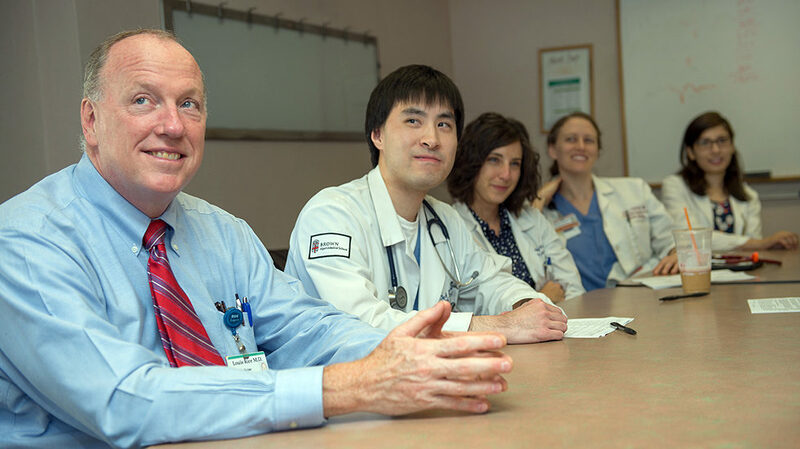 Rhode Island Hospital ward teams to meet with Dr. Rice for teaching rounds in a small, group setting. Both medical students and residents present clinical cases to Dr. Rice. Emphasis is placed on focused physical exam findings, differential diagnosis and the process of clinical decision making. In addition, conversations typically highlight topics of medical ethics and responsible utilization of medical resources. The Schwartz Center Rounds are held monthly at both The Miriam and Rhode Island Hospital, and are an opportunity to bring together different care-givers in one setting. These gatherings are designed to explore the human dimension of health care, enhance communication among caregivers, promote teamwork among caregivers, and give participants knowledge and insight into the non-clinical aspects of patient care. Medical Grand Rounds is a weekly fixture at Brown. Occurring every Tuesday from 8-9AM in Rhode Island Hospital's George Auditorium, the conference emphasizes cutting edge medical science within our own institutions as well as by nationally-recognized leaders in medical research and education. Moderated by the Chair of Medicine, the conference also showcases the great diversity of clinical and scientific activity taking place at Brown. Morbidity and Mortality is a multidisciplinary conference open to the entire Department of Medicine that runs once a month throughout the year. Colleagues from Pathology, Radiology, Emergency Medicine and other specialties are also frequent participants in the proceedings. The Chairman of the Department facilitates a discussion involving the audience in an effort to emphasize teaching points developed by the Chairman, the Program Directors, and the Chief Residents. Program-wide Journal Club is led by PGY-2 and PGY-3 residents at all three participating institutions at Brown. This session is held twice per month and is moderated by assigned faculty and chief residents. All interns, residents and students are welcome to attend. Primary Care Journal Club is held weekly as part of the Ambulatory Block rotation in that program.